Chanting and clapping or tapping rhythm syllables is an easy and fun way to quickly learn even complicated rhythm patterns. In this lesson you will learn what syllables you can use, and how to combine them for different rhythm patterns. There are MANY different ways (and schools of) of sounding or chanting rhythms- this method is just one of many. If you choose to use “Ti”, “Ta” or whatever, doesn't really matter. Sounding the rhythms before clapping, tapping or playing, makes it a lot easier to perform even relatively complicated rhythm patterns. 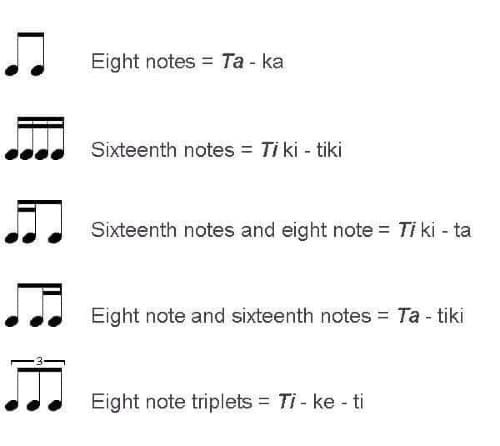 This method is even easier than counting rhythm, since you will focus on the sound of the rhythm, rather than numbers. By learning to read notes in groups or patterns you will also speed up your note reading skills. shorter note values that are grouped together to form 1 or more beats. Since this is a beginners lesson we will only use simple time signatures, like 2/4, 3/4 and 4/4, where the quarter note is worth 1 beat. First learn how to chant the syllables for each note value or group. Practice different rhythms by chanting the syllables while clapping, stamping or tapping a steady beat. Then clap, tap or play the rhythm (not the beat), together with and same as the chanting. If you can, stamp the steady beat with your foot, or use a metronome. Otherwise, just feel the steady beat inside you. Finally, clap, tap or play the rhythm pattern while thinking the rhythm syllables. For extra cool factor: Instead of stamping the beat, or using a metronome- try using conducting patterns as you speak the rhythms! For rests you say shh for each silent beat. When clapping the rhythm, don't clap or tap on rests. As you get more confident, leave out the shh and just stay quiet for the rests, while keeping the beat going of course. Practice with these examples. 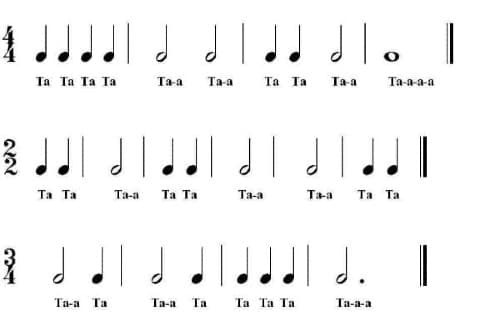 Remember to keep the beat steady as you chant the syllables! Tip: Triplets have to be very evenly spaced on the beat; ti - ke - ti. Imagine saying Winnie-the (Pooh) without the Pooh. For rests shorter that a beat, simply replace the syllable with a "shh". Let's practice! Remember to keep tapping a steady beat with your hand or foot. Remember to keep a steady beat. Chant the syllables (which you should have learned by heart by now! ), then chant and clap the rhythm. 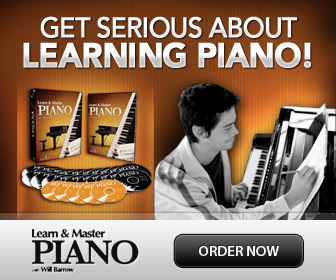 Finally tap or play the rhythm on your instrument.